Yeah! I think so too, but there's an uncanny resemblance to the object photographed by Armstrong on the Moon. It seems to be in the same area, but with a decade between the photographs!! exact same photo just color/contrast adjusted and turned 90 degrees. Huh? I didn't know that Neil Armstrong was also on the Apollo 16 as the official photographer? * John W. Young - Commander. * T. Kenneth Mattingly Jr. - Command Module Pilot. * Charles M. Duke Jr. - Lunar Module Pilot. You are right. This one has showed up in other footage too as a UFO, but is the EVA floodlight/boom. Kind of boring, but true. here are some intriguing pics of huge cigar shaped objects in the Solar System. Whether they are alien craft or man made or photo glitches, I leave it for you to decide. Here are some of the most intriguing cigar shaped objects photographed by our spacecraft as well as the HST that cannot be easily explained away. Hi mikesingh, thanks for sharing, great thread as usual. strrd and flggd. Your thread is about the cigar shaped ones, so I stick only to those. Personally I don’t have to be convinced anymore that our solar system is populated with many different Alien type visitors who has bases there all over the place. So therefore could those colossal cigar shaped objects in those really beautiful pictures indeed being some mother ship type Alien crafts or even for the time being parked huge super structures who are total self-sustaining communities in my opinion. I wish I could take a look there, what a magnificent experience would that be? But about those two pictures, I have to ask you. How big are the odds of photographing with a decade between the photographs two “different” objects on the moon who are in my absolute amateur eyes in fact 100% identical except the colours and clearness so to speak. 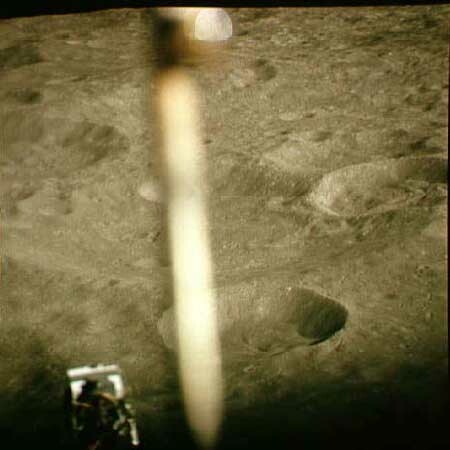 It are exactly the same craters and the object is absolute exactly at the same location in relation with those craters. Can it be that they are in fact one and the same picture, where of the Neil Armstrong one is processed then [usually done by NASA] and the other one later published under a different name and time so to speak? Thanks for mentioning that as also said by others marvellous book, The Ringmakers Of Saturn from Norman Bergrun. It is really a must have, so I hope I would get it myself sometime in a second-hand store in Holland someday, because the original is to expensive for me. Well, as per the image details, one is taken by Armstrong from Apollo 11 and the other from Apollo 16. It is most likely the same object that's been photographed. But you are right when you say that there is a possibility that both the images are the same but with a change in the hue, saturation and contrast. I think the only way this can be cleared up is to get the gen from Neil Armstrong himself! So therefore could those colossal cigar shaped objects in those really beautiful pictures indeed being some mother ship type Alien crafts in my opinion. It is really a must have, so I hope I would get it myself once in a second-hand store in Holland someday, because the original is to expensive for me. The Saturn anomaly has always baffled me as I can't disprove it and I have not tired of it yet. Just Hyp's two cents, Cheers! In the context of unidentified tubular objects in space, I would like to also point you to some clips I shot on 02/09/2009 of Betelgeuse in the Orion constellation. I think these might well be related. and here is an update that was shot yesterday-today in the night to rule out lens artefacts sofar.